If you are looking for fast and professional PC and server repair services for your home or office, you can trust Creative IT. We are a London based global PC and server repair service provider with an excellent track record. At Creative IT, we offer a complete range of repairs including same day repairs and maintenance of PCs, laptops and Macs. Our professional PC computer repair services includes solutions for all software and hardware problems, network and cable issues. We fix with all faults associated with your PC such as hard disk failures, software issues, data recovery, viruses and internet connection issues. We help to transform your out of date, low performance PCs to the most modern standard specifications. 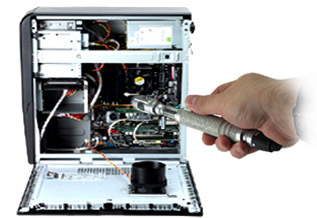 Our team of experienced technicians are trained to handle all type of PC computer repairs. We not only repair your PC, but also give sound advice for protecting it in the future. We can repair your server quickly and effectively. We have experience in server hardware and operating systems and can deal with all the makes and models including Microsoft Windows 2000 and 2003 servers, Dell Business servers, HP Proliant, Cisco small business servers and IBM systems in particular. We also offer extended maintenance contracts which can save proactive companies precious IT funds through regular network checkups and repairs. We can provide depot server repair, cooperate laptop and PC repair, server setup for homes or offices, server upgrade including memory, drives and processors. We service and repair most brands, makes and models of servers. We provide a fast and efficient same day server repair service whenever possible. We undertake the repair of almost all the components of your PC computer such as hard drive, motherboard, power supply, memory chips, video card, screen, keyboard, network cards, floppy drive and zip drive, DVD ROM, CD ROM, sound card and other associated components. We also undertake virus removal and repair, operating system installation and upgrades. We can also install and configure printers/scanners/ cameras, improve your overall system performance, improve the speed of your network connections, organise data backup, set up spyware removal and prevention, sort out your firewall configurations, carry out hard disk data recovery and repair system file errors. Call 020 7237 6805 for accessing our PC and server repair services or email us at info@creativeit.net . We are open Monday to Saturday from 0900 until 1800. .